Darcy is made from a dark brown fuzzy material with large, sparkly gold button eyes and a black button nose with black stitching for his mouth. He has a beige coloured muzzle and beige material for the inside of his ears. 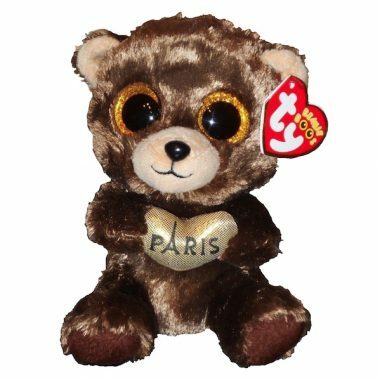 He holds a sparkly gold heart in his paws with “Paris” written on it in black. But only when the weather’s warm and in the bright sun! Darcy was released in September 2017. His birthday is on 6th June.